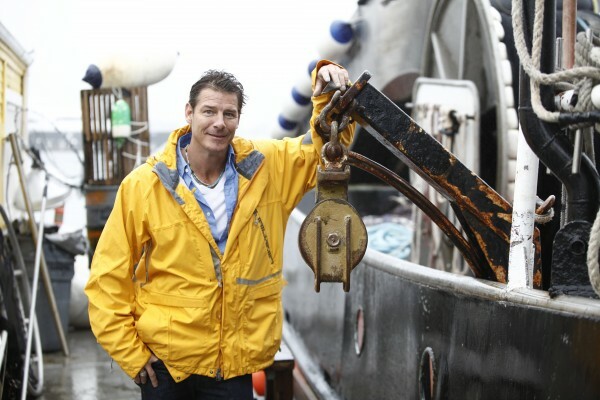 Ty Pennington is hosting a new show on HLN, the first episode of which will feature lobster fishermen from Maine. The episode is scheduled to air on HLN at 8 p.m. Saturday, Jan. 12, and at the same time the following day. ELLSWORTH, Maine — Anybody familiar with the commercial fishing industry, especially Maine’s iconic lobster fishery, will know that it doesn’t fit into a typical 9-to-5 schedule. So it most likely will not come as a surprise to most Mainers to learn that, when producers and television crews from Headline News set out last summer to profile “individuals and communities who have found inventive and surprising ways to address today’s challenges by applying the lessons of American pioneers,” that offshore island fishermen and their families would be featured on the show. The new show is called “American Journey” and is being hosted by Ty Pennington, former host of “Extreme Makeover: Home Edition” on ABC. The first episode of the half-hour show, which features the Maine lobstermen, is set to air on HLN at 8 p.m. Saturday, Jan. 12, and will air again at the same time the following day, Sunday, Jan. 13. The aim of the show, according to HLN officials, is to highlight the “resourcefulness and resilience” in the lives of Americans whose work ethic is more about lifestyle than it is about putting in an eight-hour shift for his or her boss. “With programs like this, and our new daily program ‘Making It in America,’ HLN is deepening and broadening its coverage of news stories that really hit home for our national audience,” Scot Safon, executive vice president and general manager of HLN, said in a prepared statement. Other upcoming episodes include profiles of a modern-day collective commune and of Delta blues culture, according to show officials. Last summer, television crews came to Hancock County to meet and ride along with a couple of lobster fishermen to talk to them about what they do and why they do it. Robert Howell, a senior producer for HLN, wrote Thursday in an email that the cable network was interested in the lobster fishery because, in an unusual combination, lobstermen have been having a tough time financially even though catches have hit record highs and the resource appears to be healthy. Merrill said Wednesday that an HLN film crew arrived on the island offshore community last August, in the midst of a blockade by Canadian fishermen of Maine lobster imports. An unseasonal glut of Maine lobster last spring and summer temporarily pushed prices that fishermen earned for the catch to their lowest levels in decades, which caused alarm for lobstermen on both sides of the border. Merrill said he took two production crew members out in his boat and talked about lobstering with them while they recorded video of him hauling traps and sorting his catch. “I was happy to talk to them about our situation,” Merrill said. The island fisherman said he hopes viewers get to know a little more about the hard work and stewardship Maine lobstermen have invested in their industry and that fishermen, like many across the country, have been having a tough time as the economy has sagged. Maine lobstermen are independent owner-operators and have been feeling the pinch in an increasingly global economy that seems to favor big business over smaller entrepreneurs, he said. An attempt Thursday to contact Jason Joyce was unsuccessful. Joyce is featured in a promotional clip of the show on the HLN website, however. In the clip, he talks about how important fishing has been for him and his family, generations of whom have lived offshore from Mount Desert Island. Joyce echoed Merrill in the clip, acknowledging that many people across the country have had to make adjustments as the economy has made their incomes stagnate or even decrease.